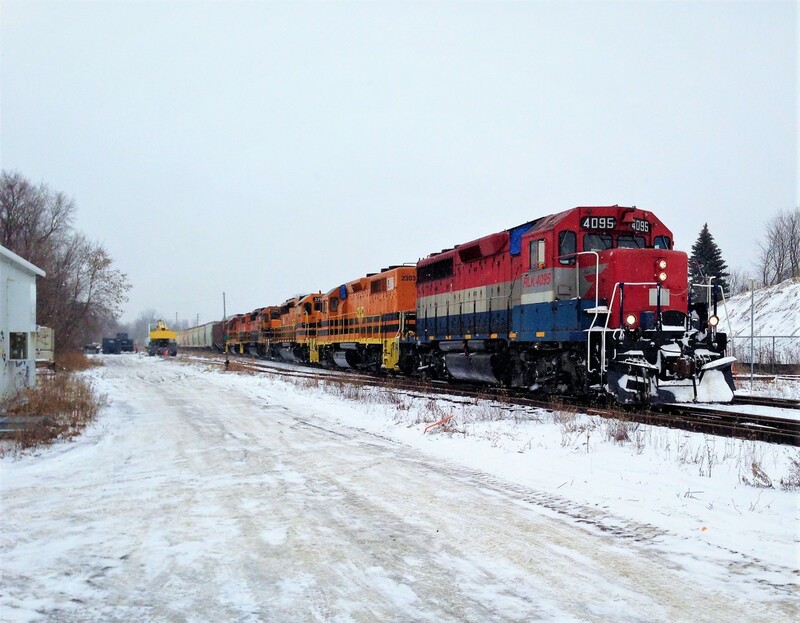 Railpictures.ca - Jason Noe Photo: Goderich-Exeter Railway train 431, powered by a five-pack, is seen slowly approaching the Alma Street crossing in Guelph with 93 cars. Powering the lengthy train is RLK GP40 4095, GEXR GP39-2C 2303, GEXR SD40-2’s 3393, 3394 and QGRY GP38-2 2008. | Railpictures.ca – Canadian Railway Photography – photographie ferroviaire Canadienne. Caption: Goderich-Exeter Railway train 431, powered by a five-pack, is seen slowly approaching the Alma Street crossing in Guelph with 93 cars. Powering the lengthy train is RLK GP40 4095, GEXR GP39-2C 2303, GEXR SD40-2’s 3393, 3394 and QGRY GP38-2 2008.